Served anytime. We serve white, whole wheat, rye, sourdough, or 9 grain breads. You can also substitute egg beaters, add an egg, add country gravy or brown gravy or add Cheddar cheese . One homemade buttermilk biscuit and hashbrowns, smothered in country gravy served with 2 sausage links. A grilled 6oz. steak served with two XL eggs, hashbrowns and toast. Half-pound ground beef, grilled and served with two XL eggs, hashbrowns and toast. Diced ham, two XL eggs and Cheddar cheese all scrambled, served with hashbrowns and toast. Grilled and served with homemade country sausage gravy, 2 eggs, hashbrowns and toast. Two XL eggs, sausage and mushrooms, topped with Swiss cheese, served with hashbrowns and toast. Your choice of one of the above, two XL eggs, hashbrowns and toast. Homemade hash, 2 XL eggs and toast. Two large homemade biscuits smothered in our homemade country sausage gravy. Two XL eggs, ham on an English muffin topped with hollandaise, served with hashbrowns. These tasty 3XL egg omelettes are served with hashbrowns and toast...add mushrooms to any omelette for just a little more! Diced ham or substitute bacon or sausage with Cheddar cheese. Sausage, Swiss cheese, onions, mushrooms and sour cream. Seasoned ground beef, Cheddar cheese, fresh tomatoes and onions, sour cream and salsa on the side! Make it “Mike’s special” … add chili! Yummmmm! Diced ham, green pepper, onions and Cheddar cheese. Crisp bacon, Monterey Jack cheese and topped with fresh tomatoes. Your choice of Cheddar or Swiss. Diced ham, Swiss cheese, fresh mushrooms and pineapple. Smothered with delicious chili inside and out, topped with cheese and onions. Spinach, green peppers, onions, mushrooms, tomatoes & cheese. Diced ham, bacon and sausage with Cheddar cheese. White, whole wheat, rye, sourdough, or 9 grain. Fire roasted corn, diced jalapenos and red peppers with Cheddar & Mozzarella lightly battered and deep-fried. Deep fired with Thai chili sauce. Tortilla chips topped with Cheddar Cheese, tomatoes, jalapenos, onion, sour cream, salsa & guacamole – and you can add chili and taco meat or Fajita chicken! Deep fried naked wings served hot, BBQ or teriyaki. Cheddar and Monterey Jack Cheeses with mild green chiles – you may add fajita chicken or grilled steak and/or jalapenos! Deep fired pork potstickers with teriyaki dipping sauce. 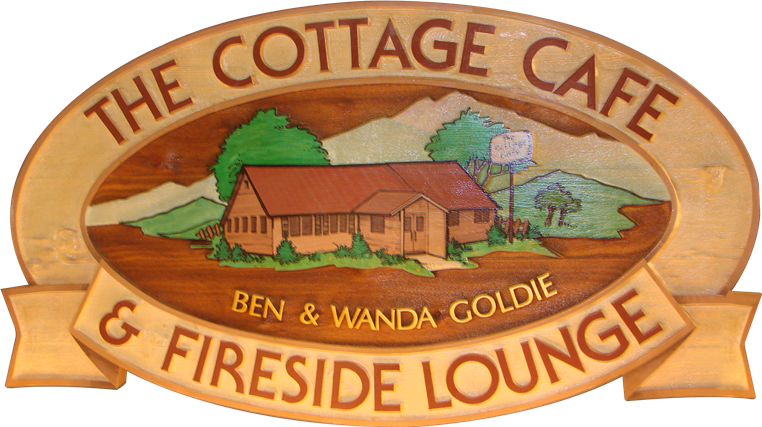 The Cottage Cafe has had a long tradition of making fresh homemade soups every morning...try one of our classics or ask your server for the soup du jour. Soups come by the cup or the bowl and can include Hot Cornbread and/or a Dinner Roll! Fresh greens with grilled chicken, bacon, tomato, hard boiled egg and Bleu Cheese crumbles. Fresh greens, fajita chicken or crispy chicken, black beans, corn, fresh tomatoes, cheddar cheese and tortilla strips. Fresh greens, ham, turkey, Cheddar Cheese, tomato, onions and hard-boiled egg. Fresh romaine, peas, bacon, garbanzo beans, monterey jack cheese, tomatoes, chicken and hard boiled eggs tossed with Italian dressing, served with garlic toast. Fresh romaine, grilled chicken breast and croutons tossed in a Caesar dressing. Fresh greens, tomatoes, Cheddar cheese, fresh avocado, salsa, sour cream, and black beans with taco meat all in a tortilla bowl. Cajun spiced steak, fresh greens, roasted corn and black beans, tomatoes, bacon and blue cheese crumbles. Our Burgers are lean all beef 1/3 pound patties. They are served with choice of green salad, cup of soup, french fries, coleslaw, or potato salad. You can add Bleu Cheese crumbles and grilled mushrooms! Fresh grilled mushrooms piled on top of melted Swiss cheese. Our juicy burger with thick, honey-cured bacon, Cheddar cheese, lettuce, tomato, onion, pickles, mayo and relish. Our 1/3 pound burger with thick bacon, grilled mushrooms, Swiss and Cheddar cheese, lettuce, tomato, onion, relish, mayo and pickles! My! My! Always a classic…lettuce, tomato, onion, pickles, mayo and relish. Open face on a bun, smothered in chili, topped with Cheddar cheese and fresh diced onions! Yum! Yum! Our sandwiches are served on your choice of deli white, wheat, rye, sourdough or 9 grain bread. They are also served with your choice of green salad, cup of soup, french fries or potato salad, or coleslaw! Corned Beef, fresh sauerkraut Swiss cheese and sauce all grilled on rye .. a classic! Thin sliced slow roasted beef on a Hoagie and served with au jus. In-house oven roasted turkey breast with lettuce, mayo and cranberry sauce. Thick sliced honey-cured bacon, lettuce, tomato and mayo. Our own old-fashioned homemade grilled meatloaf with lettuce and mayo on Ciabatta bun. Bacon, Lettuce, guacamole, Swiss cheese, Tomatoes and mayo on your choice of bread. Ham, turkey, bacon, cheese, tomato, lettuce, pickles, and mayo on 3 slices of your choice of toast. A cafe classic... tuna salad with diced red onion, celery and cheddar. Slow roasted beef with Cheddar Cheese, grilled on sourdough and served with au jus…this in one good sandwich!! All steaks are served with choice of potato, vegetables, soup or salad and a dinner roll – and you may add mushrooms to any steak if you wish! A 12oz Choice hand-cut steak. A half-pound burger steak, char-broiled and topped with grilled onions. Grilled and served in our homemade Country gravy with mashed potatoes, vegetables, soup or salad and a dinner role. Tender, meaty chicken breast strips seasoned and deep-fried, served with fries and tarter sauce. Our very own homemade grilled meatloaf just like Grandma used to make…served with mashed potatoes, gravy, vegetables, soup or salad and a dinner roll. Half pound of batter dipped cod filets deep fried golden brown, served with fries and tarter. Applewood smoked bacon, penne pasta, housemade three cheese sauce, with soup or salad and garlic ciabatta bread. in-house oven roasted turkey breast thin sliced and served with mashed potatoes, gravy, vegetable & stuffing, soup or salad and a dinner roll. A large portion of pot roast with brown gravy, served with your choice of potato, vegetables, soup or salad and dinner roll.